I have over 28 years of experience in the power generation industry, and 6 years in the nuclear submarine industry after graduating from Clarkson University. The bulk of my power generation career includes 23 years with GE® in a variety of roles including rotor-dynamic analysis, remote monitoring & diagnostics management & development, product service engineering, plant level systems integration, and root cause analysis. An opportunity with Alstom/PSM® allowed me to focus on business technical integration across multiple product lines. I am MD&A’s Gas Turbine Services Engineering Manager. 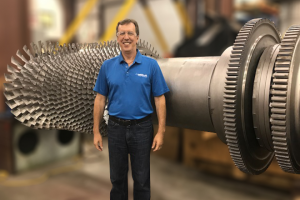 In this role, I provide engineering management, guidance, and service support for our world-class Gas Turbine (GT) outage services. Why should customers perform End of Life evaluations? The first thing our customers need to know is that the recommendation from the OEM regarding the end of a GT rotor’s design service life is a prediction. The second thing to understand is that operation and maintenance practices greatly affect the rotor aging process. A third item to consider is that not all rotor parts age at the same rate. MD&A can provide all the elements required of a rotor end of life evaluation including inspections, metallurgical analysis, engineering evaluation, and life prediction; as well as performing any rotor wheel/disk repairs or providing new wheels/disks based on the cost, benefit, and risk analysis customized for each customer’s particular needs. Why should customers perform a thorough Root Cause Analysis after an unexplained event? Completing a Root Cause Analysis (RCA) for an event, catastrophic or otherwise, is critical prior to taking corrective action and restarting the unit. Fully understanding the root cause of an event will define the proper corrective actions needed to mitigate or eliminate the chance of repeat failure. MD&A prides itself in performing RCA’s that focus purely on the facts, physics and operational history of the machine. Once the RCA has been completed, MD&A can provide all the services and parts required to correctly address the issues. It’s difficult for me to pick one project that I would call my favorite at MD&A. The opportunity to work on such a variety of projects that satisfy our customer’s needs makes my job very interesting, and every project we work on has something unique that makes our work here at MD&A both fun and challenging. If I could have any super power, I would choose the ability to see the future. Part of my career involved developing diagnostic and predictive rules for monitoring gas turbines. Being able to predict what will happen in a gas turbine’s future is the holy grail of remote monitoring & diagnostics. Having that super power would make me the ultimate monitoring & diagnostics center, not to mention that I would be a stock market whiz!! Contact Rich today using our Contact form.